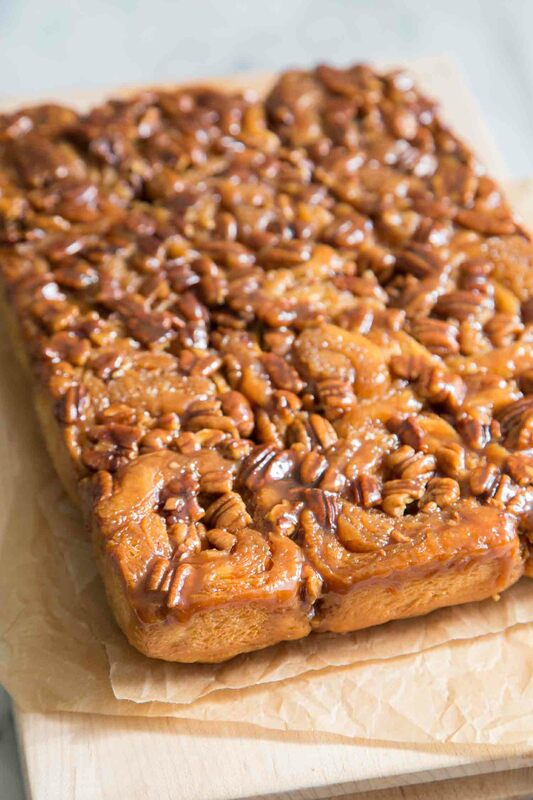 This Pecan Sticky Buns recipe was first posted on Recipe Girl. Brioche dough filled with cinnamon sugar (lightly hinted with citrus) topped with a luscious pecan studded caramel sauce. With a mug of coffee, what else could you want for breakfast? This is the kind of breakfast pastry usually reserved for special occasions like birthdays and holidays. It’s rich, decadent, and oh so sweet. Let’s be honest- the tastiest foods are not always the healthiest. 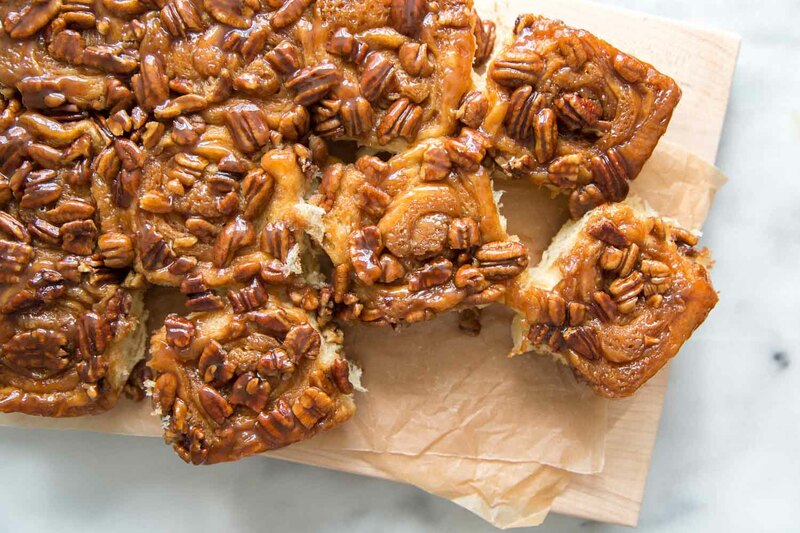 Pecan sticky buns are just an excuse to eat dessert for breakfast. What is the difference between sticky buns and cinnamon rolls? 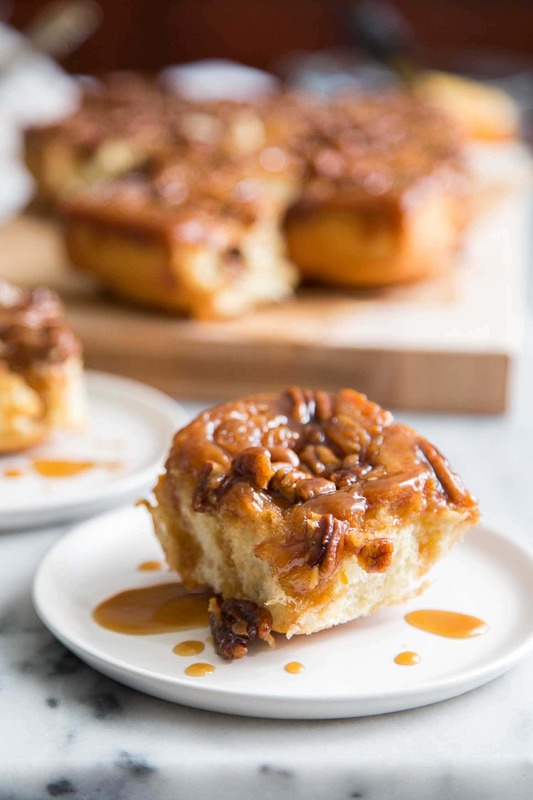 While sticky buns are often filled with the same cinnamon sugar mixture as cinnamon rolls, the main difference between these two breakfast pastries is the caramel sauce that tops sticky buns. 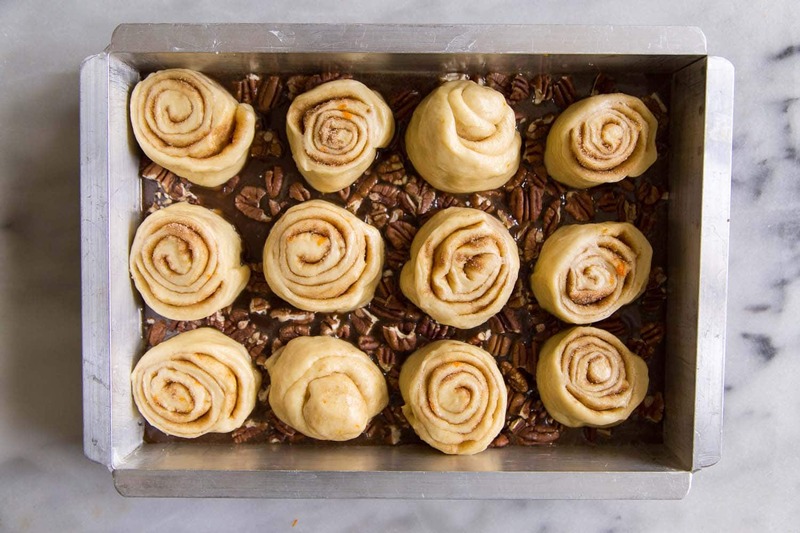 The rolled buns are placed in a baking pan lined with caramel and pecans on the bottom. After baking, the pan is inverted to reveal the pecan caramel sauce topped buns. Baked cinnamon rolls are topped with simple glaze (powdered sugar and milk) or frosted with sweetened cream cheese. Brioche dough filled with a citrus hinted cinnamon sugar mixture and topped with a luscious pecan studded caramel sauce. In the bowl of a stand mixer, sprinkle the yeast over warm milk. Stir to combine. Let sit for 5 minutes to activate yeast. Whisk in the sugar and eggs. Attach the dough hook to your stand mixer. Add the flour mixture to mixing bowl in three additions while the mixing is running on low speed. The dough will be sticky. Do not be tempted to add additional flour. With the mixer running on low, added the softened butter one tablespoon at a time. Continue to mix until the butter is thoroughly incorporated. Increase speed to medium and knead the dough for 3 to 5 minutes until the dough is soft, smooth, and pulls away from the sides of the bowl. Transfer the dough to a lightly oiled large bowl. Cover with plastic wrap and let rest at room temperature for 90 minutes. While the dough is resting, make the caramel sauce. Caramel Sauce: In a medium sauce pot, melt the butter over medium heat. Once the butter is melted, add the brown sugar and honey. Stir to combine and bring to a simmer. Remove from heat and whisk in the heavy cream. Let cool. Store in the fridge until ready to use. Filling: Whisk together the brown sugar, sugar, and cinnamon. Set aside until ready to assemble. Lightly grease a 9 x 12 inch baking dish. Pour about cooled caramel sauce into baking dish, reserving about 1/3 cup. Sprinkle the pecans over the caramel sauce. Roll the dough into a 17 x 13-inch rectangle. Sprinkle the cinnamon sugar mixture over the dough. Sprinkle the orange zest over the dough. Starting at the long end, roll the dough into a tight log. Pinch the seams together to seal the dough. Slice the log into 12 equal portions. Place the rolls cut side down onto prepared baking dish. Cover with plastic wrap and let the rolls rise for 60 minutes. Center a rack in the the oven and preheat oven to 350° F. Remove the plastic wrap and bake the rolls for 35 to 40 minutes until golden brown on the outside and the internal temperature of the bread hits 190° F. Let the rolls sit in the baking dish for 3 minutes before inverting into a serving dish. Serve warm with reserved caramel sauce, if desired. If you would like to make the sticky buns the night before, you can let them proof overnight in the fridge. After placing the cut rolls in the baking pan, simply cover with plastic wrap and let chill in the fridge overnight. Before baking, let it come to room temperature (about 30 to 45 minutes) and then bake according to normal instructions. 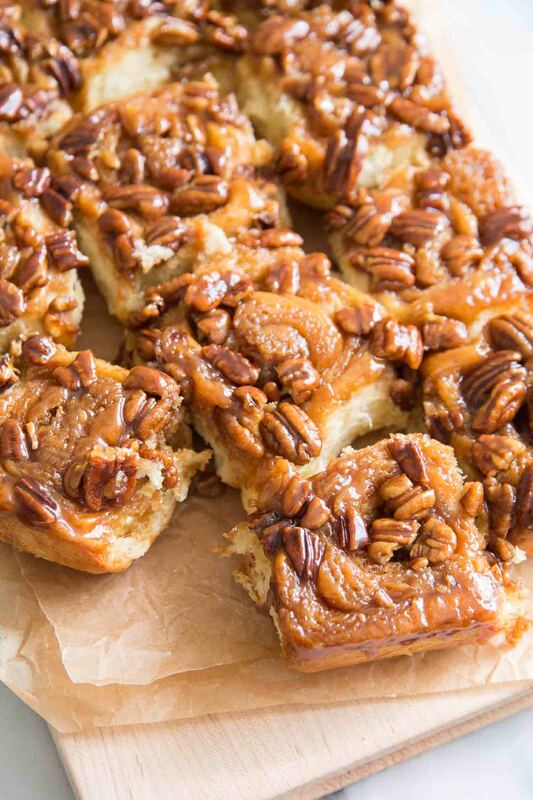 Sticky buns are best enjoyed the same day they're baked. However, these can last up to 3 days at room temperature. Keep uneaten sticky buns tightly wrapped in plastic wrap. Reheat in the microwave as necessary.